"Twilight falls, Davokar darkens.” The goblin Fenya sounded calm, despite the flock of violings that swarmed eagerly around them – the nasty birds could predict bloodshed, they all knew that. Kvarek felt the sweat on his palms threaten his grip on the spear and shouted over his shoulder: “Magdala, hurry up!” The witch didn’t answer, lost as she was to the sinister harmonies of the ritual, her hands caressing the pillar’s grim stone face. Detailed guidelines for how to create adventures; 38 monsters and adversaries, and 19 monstrous traits to arm the characters’ enemies with more than 50 pages describing the game world’s history, geography and cultures, focusing on four particular settings: the Forest of Davokar, the fortune hunter’s town of Thistle Hold, the Ambrian capital Yndaros and the cliff of Karvosti where the barbarian clans convene. Symbaroum is a complete roleplaying game; all you need to play is paper, pen and a dice set. The roleplaying game Symbaroum is suitable for all adventurous humans, goblins and trolls from the age of 12. 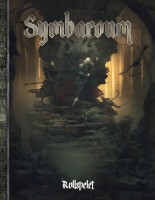 Add a Review for "Symbaroum"